The rising sun’s golden fingers gently touched the thick ice of the frozen lake that cold winter morning in 1953. Fourteen-year old Johnny enjoyed the warm caress of the rays as he sat on the edge of the lake lacing on his racing skates. He had arrived a few minutes early for his shift on the Packanack Lake, New Jersey, Ice Patrol. During the winter months when the ice was frozen solid, friends and community members regularly gathered at the lake to enjoy skimming across the glassy surface and spending quality time together. As he continued his preparations, his mind occupied with the day’s plans, he heard a foreboding sound – a crack like the sound of a gun shot split the air. He raised his head to glance across the ice and saw a gut-wrenching scene. A lone skater had passed the marked point of safety, broken through the ice, and was desperately clinging to the edge, struggling against the strong current. Thinking quickly while adrenaline began to flow, Johnny finished lacing his skates. Ignoring the sting of the biting cold on his exposed face, he raced with great speed and agility across the ice towards the victim. Reaching the end of the safe zone, he saw more clearly the panicked face of the young girl who was fighting for her life. With horror he recognized Vera Brightly, the sister of his best high school friend. Without a thought for his own safety, he flattened his long body on the frigid ice and inched his way forward, speaking softly to calm the frightened girl. Inching closer, he extended his hand, instructing her to grab hold and to kick her feet with all the energy she had left. Slowly and painfully he dug his skate tips into the solid ice behind him and inched backwards, praying all the while that the ice would hold. While the crowd who had now gathered held their breath, the pair steadily made progress until Vera was out of the dangerous water and back on solid ice. With shaking legs Johnny skated her to the edge and neighbors jumped in, taking her home to warm her and get her needed medical attention. 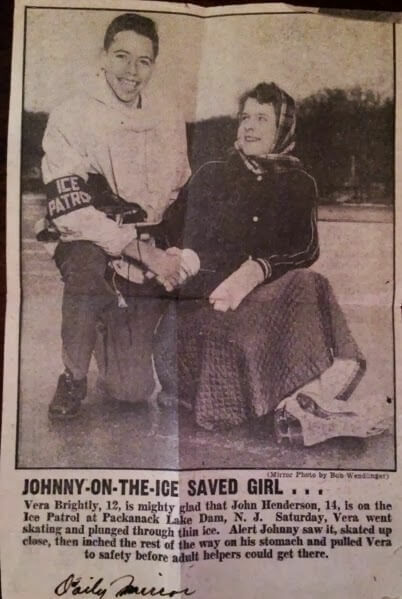 John was the hero that day – “Johnny on the Ice” as the papers called him. More than the press and praise, he was so grateful to have been at the right place at the right time to save his best friend’s sister and restore her to her family. Just like Vera, all people today are in grave danger. Because we are born sinners, we are skating outside the perfect safe zone that God requires for relationship with Him. There is no hope in and of ourselves for rescue. We are eternally doomed to break through the ice and be pulled under the water by the icy currents of sin. Who can rescue mankind from this sure and certain death? Thanks be to God! In His mercy He sent His only Son, Jesus Christ, to extend His hands out on the Cross of Calvary to pay the penalty for our sins. His death and resurrection have made it possible for our rescue. If we reach out and grasp His hand, He will pull us from the domain of darkness and transfer us into His Kingdom. By God’s grace we will gain solid footing in our relationship with God that can never be taken away. What happened to Johnny? 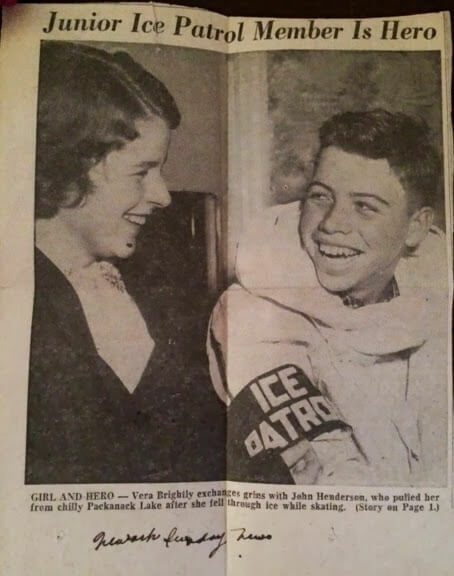 Accepting and dedicating his life to Christ, the One who rescued him from eternal death, John F. Henderson, your grandfather, has spent his life telling others about God’s saving power. By his testimony many have reached out to take the nail scarred hand and have been pulled into life with Christ. What better way to thank the Savior of our souls by telling others how they also can escape! May we each spend our days here on earth pointing others to the true Hero – our Savior, the Lord Jesus Christ!